Like much of the country, my Sunday nights have been taken over by the characters of Downton Abbey and their various trials and tribulations. Will valet John Bates succeed at shaking off his vindictive wife so he can marry true love (and head housemaid), Anna Smith? Will Lady Mary and Matthew Crawley finally acknowledge their feelings for each other and seal the deal? And what impact will the scheming Vera Bates have on all this potential happily-ever-after? Yes, it’s a soap opera, but it’s a soap opera of the most delicious kind, and one to which I’m all too happy to devote the end of my weekend. Of course, being a food-oriented person, planning a night in front of the TV also means planning what I’ll be eating there, because what’s good television without good food? And not just any “good food” but something that’s in keeping with the program’s very English storyline. 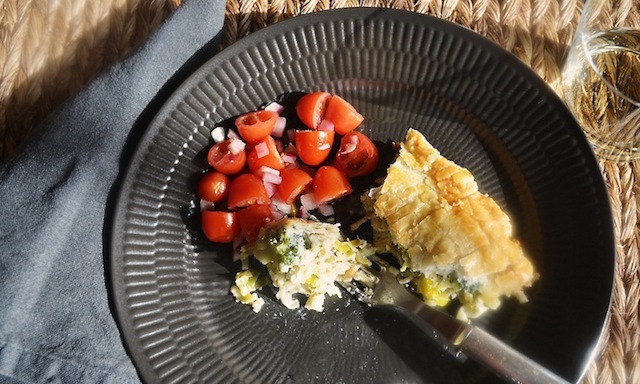 Something, as it happens, like this week’s recipe — a broccoli and Gorgonzola pie from Yotam Ottolenghi’s new cookbook, Plenty. 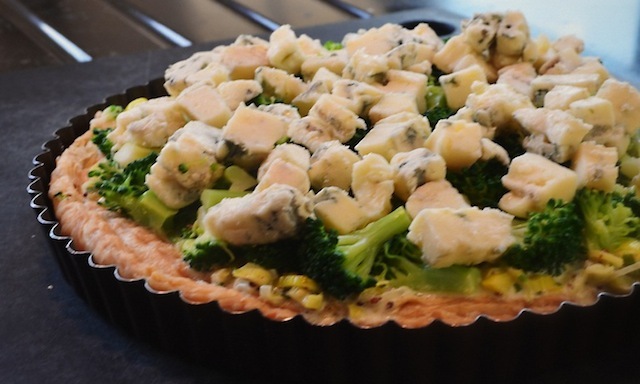 Now, what’s so English about a broccoli and Gorgonzola pie you may well be asking? Quite a few things, as it turns out, so stick with me here. For starters, Ottolenghi is the author of a regular vegetarian cooking column for the Guardian, one of Britain’s preeminent newspapers. And he’s the co-owner of four eponymous food shops around London, all restaurants known for their creative approach with vegetables and grains (though Ottolenghi is not himself a vegetarian). 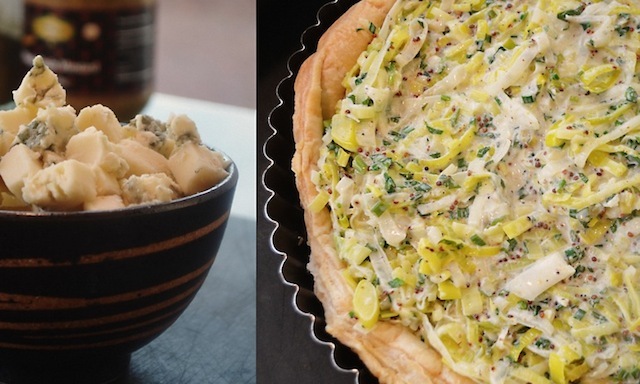 And then there’s the fact that a savory pie is by it’s very nature English — think meat pie, chicken pot pie, leek and potato pie…well, you get the idea. Having said that I should probably make it clear that I’ve never eaten at any of Ottolenghi’s restaurants, nor was I acquainted with any of his recipes prior to the Christmas holiday, when my friend Dennis presented me with a copy of Plenty. It was a gift prompted by a challenge I recently gave myself — to balance my meat centric cooking with more vegetarian options. Ottolenghi makes it easy to do that, largely by creating dishes that are so full of flavor and texture (and yes, cheese and eggs) that the absence of meat is barely noticeable. 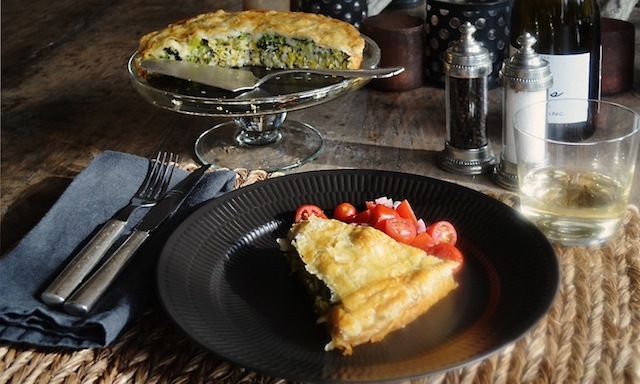 This broccoli pie is a perfect example. For one thing it calls for puff pastry, which is always a good place to get things started, especially when purchased ready-made as Ottolenghi suggests you do here (making your own puff pastry is a hassle and the end result isn’t much different than the packaged variety). Once the pastry has thawed completely (it’s sold frozen so allow plenty of time for this), roll two-thirds of it out into a circle of about 1/8” thick for the base and sides of the pie, as well as a slightly thinner piece to cover the top of what will ultimately be a large quantity of pie filling. Both of these are then placed in the freezer for ten minutes or so to harden up — the thicker piece already nestled in its pan, the second on a dinner plate. Once this step has been completed it’s time for the shell to be “baked blind,” which for those not familiar with the term (I wasn’t) simply means pre-baking the empty crust so it doesn’t get soggy once the filling is added. This is where your granny’s pie weights come in, or, perhaps more realistically, several handfuls of dried beans. Whichever you use, these are spread across a circle of parchment paper that lines the pastry shell. Place the crust in a 400-degree oven, breathe deeply to savor the buttery smell enveloping your kitchen, and once brown (15 to 20 minutes later), remove the pan from the oven, discard the beans and parchment paper, and return to the oven for a final 5 minutes of pre-bake. Piecrust made easy. As for the all-important filling, this is simply a matter of boiling a few handfuls of broccoli florets (just until tender), then sauteing a quantity of thinly sliced leeks for ten to fifteen minutes. 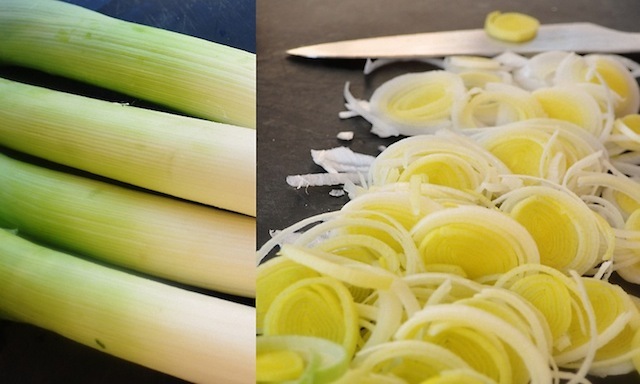 (When slicing the leeks it’s best to avoid the green parts, as the lighter sections tend to be sweeter and more tender.) 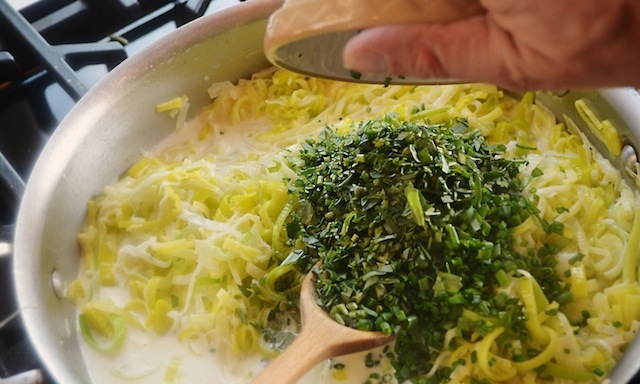 Once the leeks have been cooked down a bit, a variety of good things are added to the pan (cream, mustard, chives, tarragon) along with some salt, pepper, and a small amount of water to keep everything nice and moist. At this point you may well find it hard to keep your fork out of the pan — an understandable reflex given that few things smell better than warm tarragon and mustard simmering in a cup of cream. 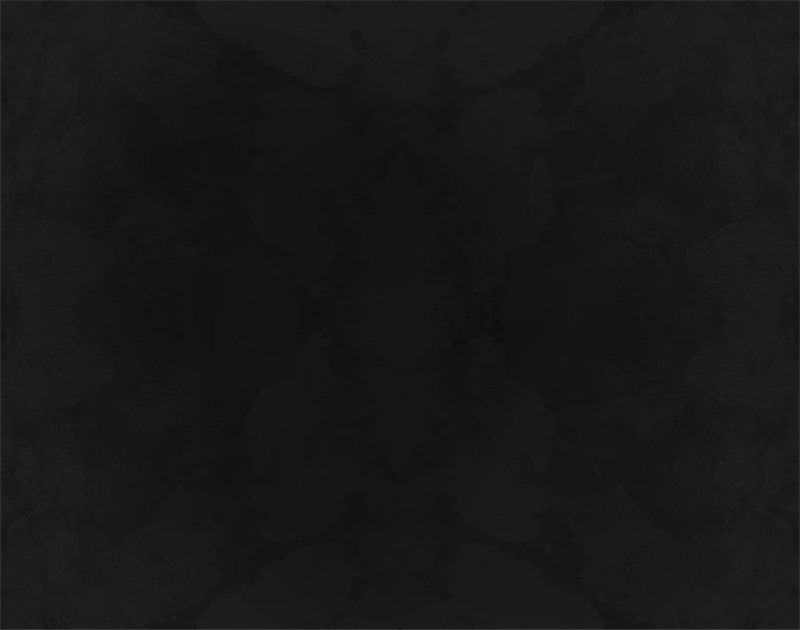 And then there’s the flavor, which recalls that classic of French cooking, leaks vinaigrette (a discovery that, in turn, may well call for a few more forkfuls, just to confirm the association). Anyway, this is your base, to which is added the broccoli, followed by a scattering of chopped Gorgonzola. It’s a combination that when baked beneath the puff pastry lid yields something compulsively eatable — the slick, buttery crackle of the crust giving way to the earthiness of the broccoli and the richness of the leaks, all of it offset by the funk of the cheese and the creamy tang of the mustard. In a word: delicious. And even a little decadent. Who knew vegetarians had it so good? —Preheat oven to 400 degrees. Roll out two-thirds of the pastry into a circle that is 1/8 inch thick and large enough to line a 10” loose-bottomed tart pan. Line the pan and trim off the excess pastry. Roll out the remaining pastry into a thinner disc, large enough to cover the surface of the pie, and lay it on a plate. Place both shell and lid in freezer for 10 minutes. —Line the pastry with parchment paper and fill it with baking beans. Bake blind for 15 to 20 minutes, or until light brown. 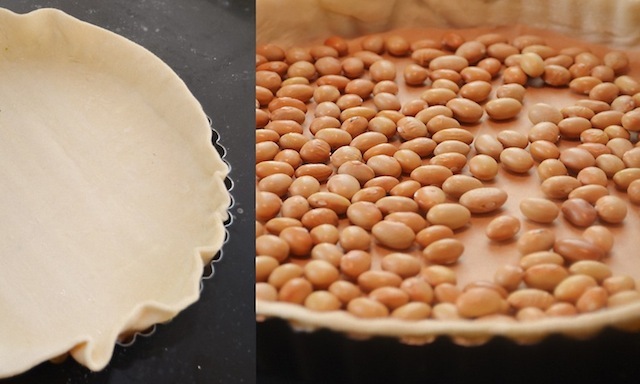 Remove the paper and beans and return to the oven to bake for 5 minutes, or until the bottom of the shell is golden. Set aside to cool. —While the tart shell is baking, prepare the filling. 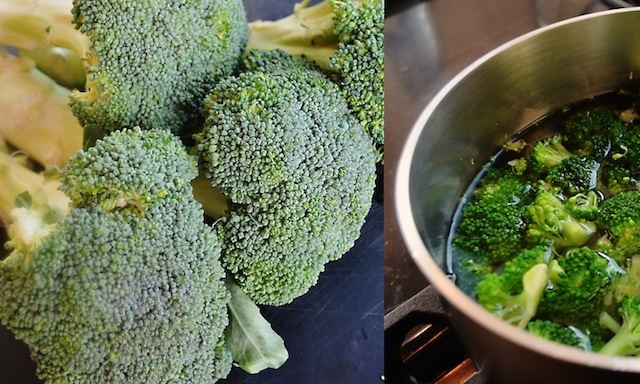 Cook the broccoli florets in a large pan of boiling water for about 2 minutes, or until tender but still firm. Drain in colander, rinse well with cold water and leave to dry. 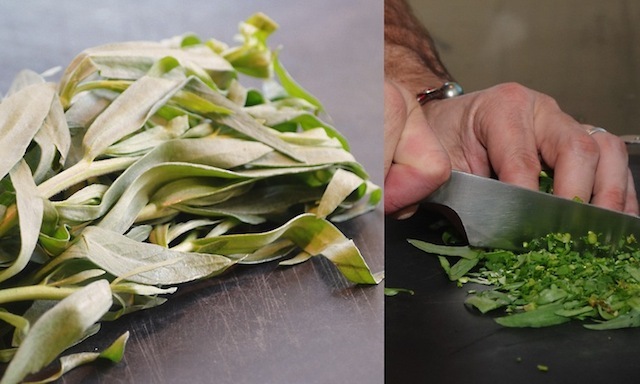 —Melt the butter in a pan and sauté the leeks on gentle heat for 10 to 15 minutes, or until soft but not colored. Add the cream, water, chives, tarragon, mustard, salt and some black pepper. Stir well and remove from the heat. 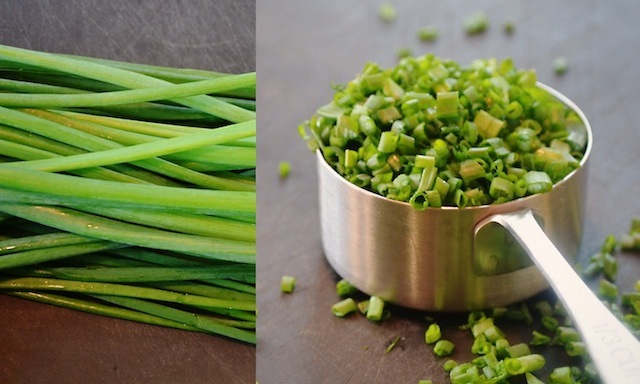 —To assemble, spread the leek mixture over the bottom of the pastry base. Scatter the broccoli on top and gently press into the leek mix. Dot with the Gorgonzola. 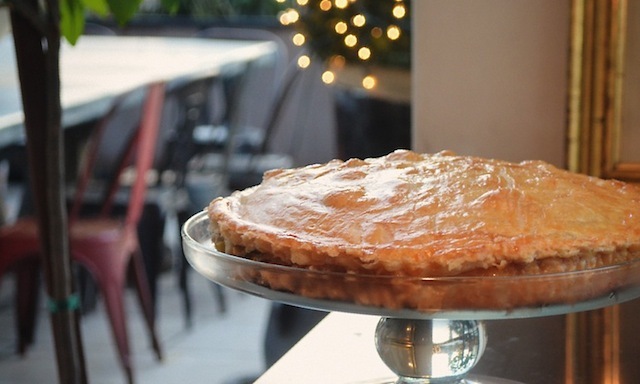 Brush the rim on the tart base with the beaten egg and place the pastry lid to the case. Trim off any of the lid that hangs over the edge. —Glaze the lid with beaten egg and bake for about 30 minutes, or until the pastry is golden brown. Allow to cool a little before removing from the pan. Sounds so delicious! Can't wait to try it. What brand of puff pastry do you recommend?? I'm a fan of Dufour — it's available at most markets.